A gift basket is an ideal present for both men and women and can be given for just about any occasion. A basket with romantic gifts is especially appealing and can contain a number of items based on the tastes and personality of the recipient. You can fill a basket with wine, chocolates, bath products or candles -- the ideas for a romantic gift basket are endless. A romantic gift basket might include a favorite wine. Wine is a universally liked gift that can be given to friends, family or loved ones. A romantic basket of wines might include a selection of sweeter reds such as merlots or malbecs or perhaps a collection of dessert wines. 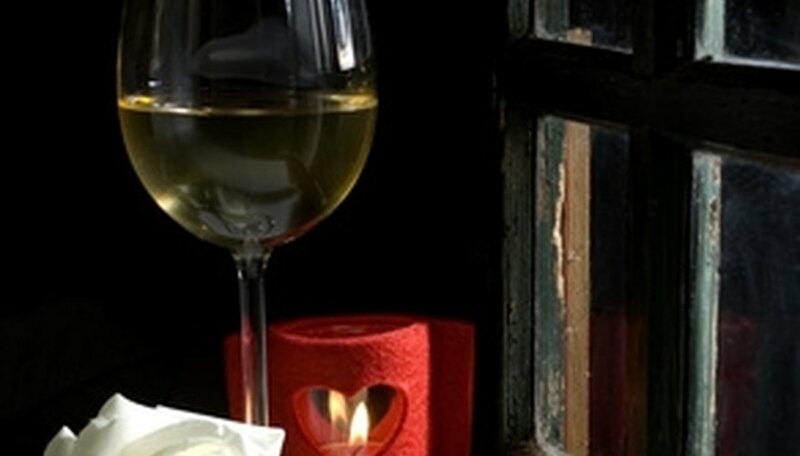 If the recipient likes white wines, feel free to include a chardonnay or sauvignon blanc. For an extra touch of romance, include a gift certificate for a home-cooked dinner. To add a really romantic twist to a wine basket, add some chocolate. Chocolates placed in a gift basket could come in any form: gourmet chocolate bars, truffles, petits fours or bonbons. Chocolate could also come in the form of baked goods such as brownies or cookies. On top of that, milk, dark and white chocolate will add variety to the basket. Chocolate tends to go best with red wines, so it may be best to put only red wines or dessert wines in your gift basket. Gift baskets containing bath and body products --- bath salts, lotions and body sprays --- will be enjoyed by just about any woman. Many stores offer a variety of products in different scents, including romantic orientals and florals. Your bath gift basket might also include candles in complementary scents and a homemade gift certificate for a soothing back massage or a weekend getaway at a bed and breakfast. Freund, Lena. "Romantic Gifts in Baskets." Dating Tips - Match.com, https://datingtips.match.com/romantic-gifts-baskets-7455005.html. Accessed 24 April 2019.